Duck potato, photographed at Green Cay Nature Center, Boynton Beach, Palm Beach County, in January 2015. Duck potato is a bit of a misnomer on several fronts. For one, there are several plants in Florida that are called duck potato by different sources, all of which are in the same family. If you look up duck potato in the Institute for Regional Conservation's online database, for example, you'll come up with Sagitaria latifolia, which has arrow-shaped leaves. 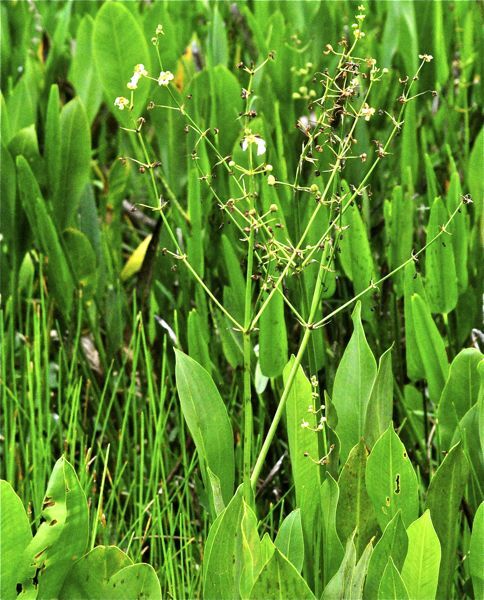 If you check out the University of Florida's Institute for Aquatic and Invasive Plants, they apply it to Sagitaria lancifolia, which has long, narrow, lance-shaped leaves. We give the nod to lancifolia simply because it's the more common of the two in Florida, particularly South Florida. Both latifolia and lancifolia have a starchy, fleshy, underground bulb-like part called a corm that's about the size of a chestnut. It is the "potato" part of duck potato. Some say the corms are a favorite food for ducks, others, including our favorite Florida forager say that ain't true, that the corms are too big for a duck to down. And while ducks are attracted to duck potato regardless of which species, it's the seeds they find tasty. Now back to lancifolia, our duck potato. 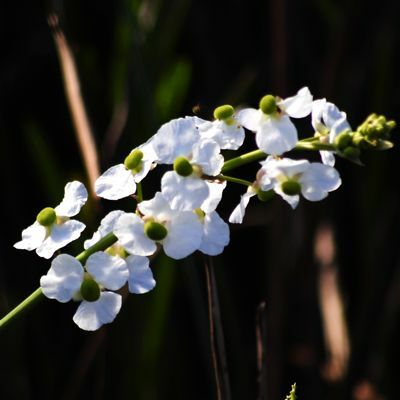 It is an aquatic plant found in swamps, marshes, ditches, along lakes and other shallow-water habitats. It is a Florida natives and are found throughout almost the entire Peninsula and parts of the Panhandle. According to the United States Department of Agriculture's PLANTS Database, lancifolia's native range includes Georgia and South Carolina as well as Florida. Other sources, including Flora of North America, extend the range along the Gulf Coast to Texas, while other sources put it in Oklahoma as well. It's also native to the Caribbean, Mexico, Central America and South America. Lancifolia is the tallest member of genus, reaching between six and seven feet tall (usually half that in our experience). 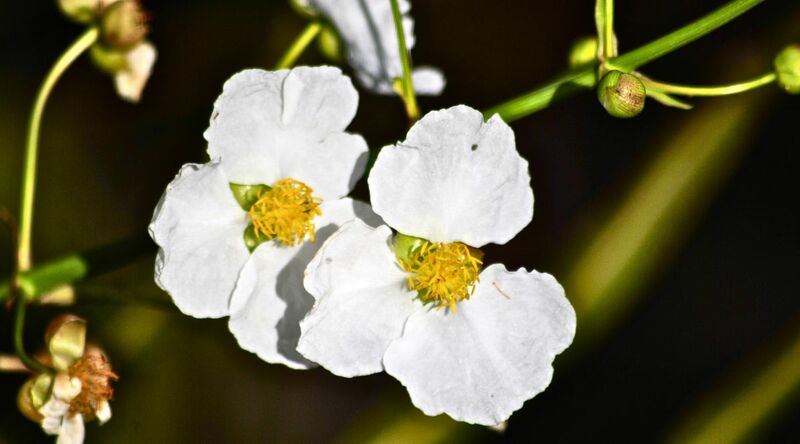 The flowers are quite showy, each about an inch to an inch-and-a-half across, with three white petals and a yellow center. The flowers grow on a stalk that extends above the leaves. While ducks haven't much use for the starchy corms, people do. Native Americans would find ponds where Lancifolia was growing and pull other plants to give duck potato more room to grow. And it can form large colonies. The corms can be eaten like potatoes — they can be boiled or roasted. Other parts of the plant are edible as well. Lancifolia is used in landscaping, in wet gardens and along ponds. Lancifolia is a member of Alismataceae, the water plantain family. Other common names: wapato, bulltongue arrowhead and lance-leaved arrowhead.